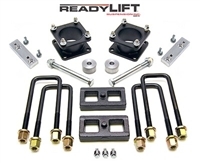 ReadyLift Suspension was founded on the principals of developing a line of economical suspension leveling and mild lifting products that would allow truck and SUV owners the ability to "level" or lift their vehicle in order to install plus-size wheels and tires. Until several years ago, truck and SUV owners had limited options available to them if they wanted to purchase larger aftermarket wheels and tires without "rubbing". There were virtually no companies developing quality front suspension leveling products that would simply "level" out a truck or SUV. ReadyLift realized that there was a huge consumer market that didn't want an expensive tall lift kit that would compromise gas mileage and that important nice factory ride. 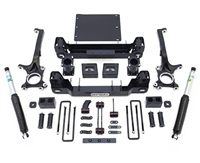 The product line of ReadyLift Suspension was developed to provide consumers with a cost-effective alternative for their needs, essentially designing the exact product they were looking for. That product is one that would take the "rake" out of the vehicle by raising the front end up enough to make the vehicle sit level from front to rear while affording the consumer the ability to purchase the wheels and tires they wanted. And most importantly, to do so without compromising the quality of the factory ride and handling. How can ReadyLift accomplish all of this while maintaining or improving the factory ride quality? 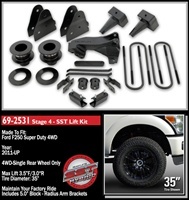 ReadyLift suspension kits are designed to retain the strong and durable factory springs and shocks. More importantly, ReadyLift lift kits are engineered to maintain the factory suspension geometry and suspension travel. Why throw out a perfectly good set of springs and shocks? 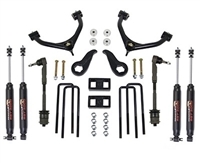 The factory springs and shocks are much more durable than in the past and the manufacturer spent many hours to design them for the optimal ride quality and durability. Why spend thousands on a tall lift kit when you can spend much less for a well engineered ReadyLift mild lift kit. Don't waste your money and get exactly what you need from ReadyLift. ReadyLift has what you need and at a price that you can afford.